Mobile SIM card data recovery application is specially designed and developed to restore all lost and inaccessible data (phone book contact numbers and names, text messages, call details with accurate sender name and number) from sim card memory. Sim card SMS reader utility also helps you to know about sim card common information such as 20 digits ICC-ID, IMSI, network service provider name and location, SDN etc. Cell phone sim card data retrieval program easily recovers all data erased by improper usage, virus infection, human error, corruption in sim card, software/hardware malfunctioning etc. Sim card deleted contact recovery tool provides you print facility of generated text reports of all recovered data with exact date and time. Sim card message restoration software provides full support to retrieve missing data even sim card is not in subscription status. 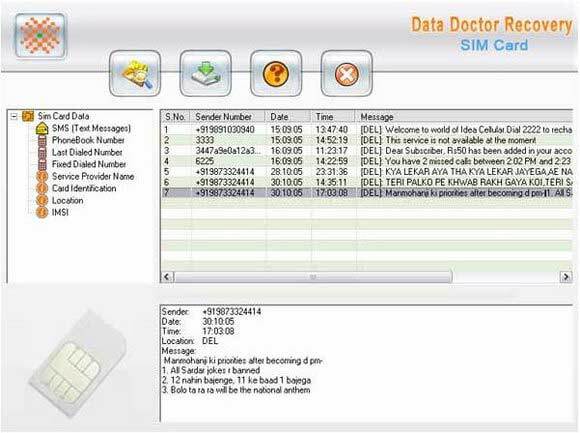 Mobile sim card data rescue tool enables you to recover lost data even your mobile phone is showing Insert Sim Card or Sim Card Not Recognized messages. Sim card data restoration software can be easily installed taking less time and space and does not require any specific technical knowledge to handle. Features: * Sim card phonebook restoration program provides you facility to access deleted data from damaged sim card. * SIM card SMS recovery tool is cost effective and non destructive utility provides efficient data recovery under all windows operating system including Vista versions. * Sim card data salvage software supports all 2G, 3G GSM technology supporting mobile phone sim cards of any country and network location. * SIM card message rescue utility completely scans corrupted sim card for fast and accurate data restoration. Windows password recovery is one of the powerful software which has the capability to retrieve or reset the lost login password of Windows operating system. It can also retrieves the missing or forgotten password of several chat messengers. SDHC card file restoration program recover deleted file folders from formatted or corrupted memory card. Memory stick data recovery software restores file from all type of memory cards like CF, MMC, T-Flash, SD, XD, Micro Stick, 3C and many more. Copiaris is advanced file copy, backup and automation tool with support of VSS (volume shadow copy), zip compression (incl. AES encryption), file versioning, Wake-on-LAN etc. Native 32/64-bit executables, 100% command line support (incl. console). Transfer iPhone SMS to Android directly. No Jailbreak/Root required. Backuptrans iPhone SMS to Android Transfer supports iPhone SMS messages to Android transfer directly. iMessage supported also. BestSync is a professional utility for synchronizing/backup file/mail to FTP/SFTP/WebDAV/Amazon S3/Windows Azure/Google Storage/Rackspace Cloud Files/SkyDrive/Google Drive/DropBox/Shared folder/USB drive with security and advanced features. Corrupted data repairing software for Apple Mac OS X restores accidentally erased mp3, mp4 songs or music collection from inaccessible memory card even if system generated error messages like ?Drive not detected? is displayed on your PC screen. This site does not contain serial number, crack, keygen Mobile SIM Card Recovery Software serial number : serial number is the simplest type of crack. A serial number(cdkey,product key,etc) is register the program as you may already know. a crack or keygen may contain harmful software. If you cannot find the exact version you want, just give it a try. for more information read .nfo/.txt/.diz file include in zipped file.